This week, Good Girls Get Rich features guest, Elena Lipson, Divine Self-Care Mentor, speaker, transformational coach and retreat leader. Creator of The Divine Self-Care Circle, a year-long journey for women who are ready to say YES to igniting their divine feminine and dropping the hustle in exchange for creating a life they love with ease and grace. 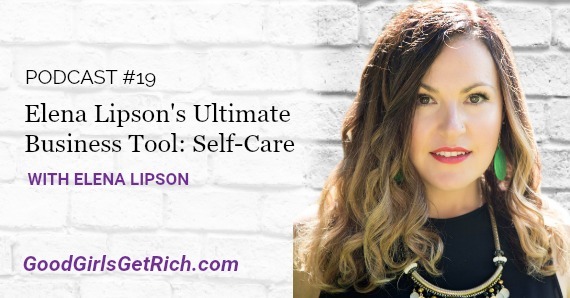 Self-care is ultimately the tool for managing how you’re showing up in your life and business – they’re all connected. When you’re living on purpose, with purpose, it’s not all about laughter and living in sunshine, but even in that struggle, there is joy. When you fail at something, tweak it. Find the right recipe and combination that fits your life.